nice s540ltd!!! i love those. $425 is a steal for those. they still fetch around $500-800 on the used market. i love the green ones with gold hardware, though. for that price, i wouldnt sweat it. the lo-pro with the aanj...mini ovals...killer. those quantums would have to go, but oem pickups always go by the wayside with me. awesome score!!! It's not a S540 LTD. Its a S540 FMTP. 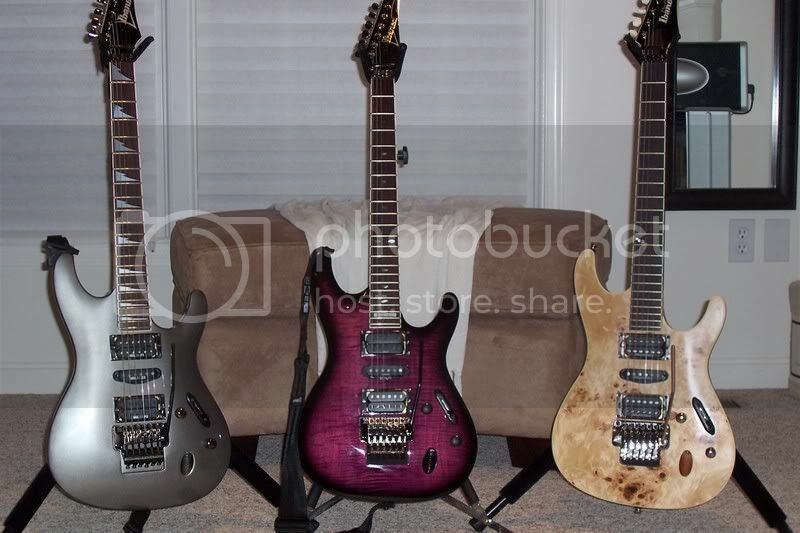 And yeah.. these guitars are going for $500-800+. Both of them. Which is ridiculous. I just got a good player condition '92 540SLR that looks like this one here except that mine has a lo-pro. the funny thing is that I've always hated the S-series after playing a S-540FM-TK back in '97. Now I've got my own that either cures or causes eye cancer hehe. With 4 HSH and 2 HH guitars I knew it was time for a HSS setup. I paid E275...after trading in my Bad Horsie wah for E100 hehe. That's cool ! I like the colour. Now I can afford strings. 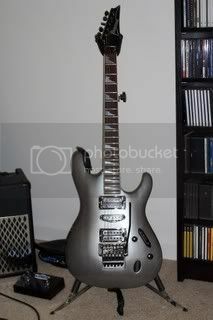 Includes Brand new Ibanez Deluxe gig bag....I'd prefer the proper OHSC but I have a few of them. Oh well. Definitely prefer the later year ones like that with the cosmo hardware to the earlier 'FM's that came with gold. Very cool man! I, personally, don't care for the gold. Anyway, I setup the new guitar. It had the wrong knobs - set screw instead of push on...they looked correct. I replaced them. How do people lose guitar knobs? The volume pot was a little loose, so I tighten it. The trem arm holder was loose - I tightened that as well. It had 4 springs and 10 gauge strings. The setup with those strings was really nice...no buzz and LOW action. Four springs are just toooo stiff for me. I took out the 4th spring and put 9's on it. Of course I then had to ...adjust the trem angle, truss rod, bridge hieght, etc. As with almost all **** guitars. The description failed to mention some pick scratching/surface scratches, etc. So I buffed it out with some 3M Rubbing Compund, Swirl Remover, Carnuaba Wax. I did it by hand...my arm is sore. I will eventually do it with a machine. That will have to wait until I completely disassemble the guitar. I tighten the neck bolts, locknut, etc. They just needed to be snugged. The fretboard wasn't too bad. I cleaned it and applied some bore oil. I will polish the frets with some steel wool later. I replaced the horrible sounding QM bridge pup with a Dimarzio Tone Zone. It took 2 minutes of playing to realize I hated the QM's. I knew that though. The TZ sounds good in it. I'll get the other QM's out of there soon. I installed a Dimarzio Clip Lock Strap. I had an extra one laying around...so I figured I'd use it. I like them anyway. I wound up installing a new trem bar. Even after replacing the plastic bushings on the old one it was loose. I had an extra bar laying around so I popped it in there and it was nice and SNUG, just how I like it. I cleaned up all the misc. screws. The locking screws for the trem post were loose when I got it. I tightened those after I got it setup. Thank god they weren't stripped, broke or who knows what else. So I still have to replace the other 2 pups. I want to sand and tung oil the neck on this guitar. I guess I'm going to do the entire back of the neck including the back of the headstock. That covers alot of S history. From left to right. yeah, i had one of those. mine had black pickups in s/s/h. i swapped the f2 for a tone zone and ended up trading it and a kramer baretta for a 5150 half stack. i almost miss that guitar sometimes. then i remember the old heel. then i don't. i also swapped the cosmo parts for black when i acquired a black lo-pro for it. the rg550 is swapped hardware for looked super sweet with the cosmo. neither are in the collection anymore. Really like the colour. Looks very nice indeed. Congrats S-man. Is there an easy way to tell the difference between 9s and 10s installed on a guitar? I've seen some of these before..
Man I love those . CONGRATS!!! I had a 1997 S 540 FMTP. It was my favorite guitar. I have been looking for another one ever since I got rid of it to help someone out.